(Clearwisdom.net) The four-day-long "Malaysian Countryside Carnival" was held on July 22-25, 2010, at National Stadium Bukit Jalil, in Kuala Lumpur. 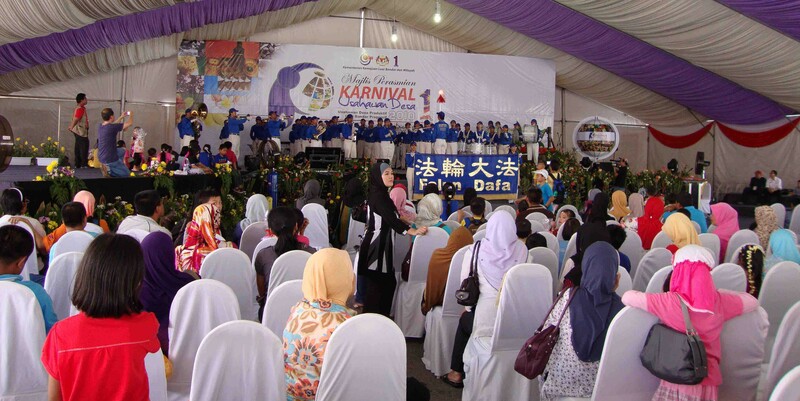 The Malaysia Divine Land Marching Band was invited to participate in the event. At noon on July 25, the Divine Land Marching Band arrived at the National Stadium, and drew much attention with their bright royal blue and white uniforms.Upon their arrival on-stage, the audience gave them warm applause. The band performed "Falun Dafa Is Good," "Delivery of Gifts," "Ode to Joy," "Thank You, Master," and other pieces. After the performance, many people asked Falun Gong practitioners for more information about the practice.